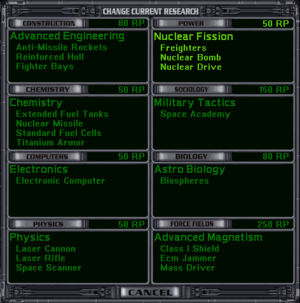 The Force Fields techs appear in the bottom left box in the Research Menu. The intro to Physics explains how the Physics and Force Fields tech trees between them force non-Creatives to make some difficult choices in order to get a decent early "beam" weapon. None. You have to research all the Force Fields techs if the game starts at Pre-Warp. Ship Shield that: completely negates 1 point of damage from each weapon that attacks (it does not even weaken the shield) ; absorbs 5 times the ship's size class in damage before failing, i.e. 5 for a Frigate to 20 for a Battleship. Regenerates 30% of its maximum strength per combat turn. This shield offers negligible protection. Ship "beam" weapon that does 6 points of damage, with no range dissipation. The unmodified Mass Driver's freedom from range dissipation makes it better than an unmodified Fusion Beam, but a fully modified Fusion Beam is better than a fully modified Mass Driver if the target has Heavy Armor, which blocks the Mass Driver's AP effect. A fully modified PD Fusion Beam is more powerful than a fully modified PD Mass Driver, but the PD Mass Driver's freedom from range dissipation allows one ship to help defend another from a swarm of missiles or fighters. Modifications: (0) HV, PD; (1) AP; (2) AF. Ship Special System that increases the ship's Missile Evasion by +70%. ECM Jammers (all versions) are the best defense against torpedoes, as torpedoes cannot be shot down and Jammers, unlike Pulsar and Lightning Field, can defend against multiple waves of missiles and torpedoes per combat turn. Cannot be used with any other jamming device. Best choice for non-Creatives: ECM Jammer unless you really want Fusion Rifle; in that case you choose Mass Driver as the first reasonable "beam" weapon. But then you have to choose Multi-Wave ECM Jammer if an enemy uses torpedoes, and that would rule out Class 5 Shield. Achievement that improves ground units' performance by +10%. Ship Special System that increases beam defense by +50% and halves turning costs. It also increases missile evasion by 25% (not mentioned in description). Ship Special Weapon that never misses and spins a ship randomly, bypassing shields and armor doing 1-4 points of direct structure damage times the size class of the target ship. In the early game, when ships have poor combat mobility and wide-arc versions of "beam" weapons are too bulky, this offers a reasonable chance of being able to fire on a ship without its being able to fire back. This tactical advantage doesn't apply to Star Bases, whose "beam" weapons always have 360° firing arcs. These can be nicely effective early on if the enemy doesn't have Reinforced Hull. Best choice for non-Creatives: Inertial Stabilizer, as it offers immediate and lasting advantages in space combat. Ground combat advantages are worthless if you lose the space battle. Not only that, but if you ever do invade a planet and win, you'll get whatever technology the enemy ground troops were using against you. Gyro Destabilizers quickly become ineffective as ships become tougher and more mobile. Ship Shield that: completely negates 3 points of damage from each weapon that attacks (these do not even weaken the shield) ; absorbs 15 times the ship's size class in damage before failing, i.e. 15 for a Frigate to 60 for a Battleship. Regenerates 30% of its maximum strength per combat turn. This is the first effective shield. Combine with a shield capacitor and an ecm jammer to create a ship nigh-invincible to early game weaponry. Ship and Star Base Special System that prevents enemy ships from retreating during combat. Best choice for non-Creatives: difficult, as all these techs are good at this stage in the game. In the longer term Radiation Shield offers the most lasting advantages, especially for Aquatics as on average 50% of Barren planets terraform to Tundra; but that means giving up some immediate military advantages. Since the choice is difficult for non-Creatives, it's clear that Creatives get a significant bonus at this tech level. Ship Special System that makes ships are completely invisible on the Galaxy map except to Omniscient empires. Note that Colony Ships and Troop Transports cannot have any kind of cloaking, so this tech is only good for raids, usually aiming to bomb colonies. At this stage in the game ships are slow in combat and Radiation Shield significantly reduces bomb damage, so bombing raids are often unsuccessful; and later there are more advanced cloaking techs. Achievement that improves ground units' performance by +20%. Achievement that gives a +10% bonus for both "Spies" (espionage and sabotage against other empires) and "Agents" (your counter-intelligence operatives). Best choice for non-Creatives: Democracies should consider Stealth Suit to reduce their weakness in counter-intelligence. For others Personal Shield may be a good investment for the time when you are ready to invade, as the alternatives offer no great immediate space combat advantage. The better your ground troops are, the less CP you need to devote to Transports and the more the enemy needs for successful invasions. You will also need to bomb less and capture more if not all population and buildings intact. This is a rare option where you don't sacrifice much to get a great ground combat bonus. Ship Special Weapon that damages all objects (friend and foe) in adjacent combat map squares. It does 2-24 points of damage times the target's size class (e.g. 2-24 against a Frigate, 8-96 against a Battleship) and is also fairly effective against missiles and fighters. Not an impressive offensive weapon: it can damage it's own side's ships, missiles and fighters; and its short range reduces its effectiveness when ships are slow in combat; later in the game enemy ships have a choice of ways to destroy ships that are armed with Pulsars before they get into range, and good "beam" or torpedo weapons are the most effective because the Pulsar offers no protection against these. May be better than PD "beams" for players with poor computers, but Lightning Field is better. Very late in the game Subspace Teleporter may make the Pulsar a usable weapon; but it's a long time to wait, and there are other ways to use the Subspace Teleporter. Building that slows all enemy ships within a range of 2 parsecs to a speed of 1 parsec per turn. Such a powerful defense for a whole system (by giving its own empire's ships plenty of time to get there) that it is often banned in multi-player games. Unlike many defenses, this gets better as the game proceeds, since your ships get faster. Its main weakness is that, if the attackers capture the colony that built the Warp Interdictor, it starts working for them, even if there are other uncaptured colonies in the system. Ship Special System that has a 50% chance of destroying groups of missiles, torpedoes or fighters attempting to hit the ship; but "fires" only once per combat turn, so can be defeated by multiple groups of missiles (see the military sections of this guide). Best choice for non-Creatives: Warp Interdictor, if not banned; otherwise probably Lightning Field. Ship Shield that: completely negates 5 points of damage from each weapon that attacks (these do not even weaken the shield) ; absorbs 25 times the ship's size class in damage before failing, i.e. 25 for a Frigate to 100 for a Battleship. Regenerates 30% of its maximum strength per combat turn. This shield is the first that offers reasonable protection against weapons in the top half of the tech tree. Ship Special System that increases the ship's Missile Evasion by +100%. ECM Jammers (all versions) are the best defense against torpedoes, as torpedoes cannot be shot down and Jammers, unlike Pulsar and Lightning Field, can defend against multiple waves of missiles and torpedoes per combat turn. Cannot be used with any other jamming device. Ship "beam" weapon that does 18 points of damage, with no range dissipation. The normal and HV versions without other modifications are as effective against large targets as similar Phasors, but the Phasor's set of modifications is better, in particular its PD and SP capabilities. Modifications: (0) HV but not PD; (1) AP; (2) AF. Best choice for non-Creatives: usually Class V Shields, as they should choose Phasors for beam weapons. They should only choose Multi-Wave ECM Jammer if they're surprised by an enemy's use of torpedoes; if they anticipated torpedoes they would have done better to choose ECM Jammer earlier, as this increases a ship's Missile Evasion by +70% and allows Class 5 Shields. Ship Special System that makes ships are completely invisible on the Galaxy map except to Omniscient empires, and in combat gives the ship a +80% increase in beam defense and +50% increase in missile evasion as long as it stays cloaked and does not fire (but it can stay cloaked while moving in combat). When decloaked, the ship must wait one turn without firing to recloak. Note that Colony Ships and Troop Transports cannot have any kind of cloaking, so this tech is only good for raids, usually aiming to bomb colonies. At this stage in the game ships are fairly fast in combat, bombs are more powerful and Transporters may now or soon be available, so bombing raids are a real threat, especially as the Cloaking Device also gives the ship some protection while moving into bombing range. Increased ship speed also makes it possible to use the Cloaking Device to pull off surprise attacks to eliminate Star Bases or small groups of enemy ships. Ship Special Weapon that "freezes" the target ship so that it cannot move, fire or be attacked. The "weapon" has a range of 3 combat squares and operates until its owner turns it off or the "weapon" is destroyed. This is potentially a powerful "equalizer" that could allow a relatively small ship to neutralize a very dangerous enemy ship, provided other enemy ships can be destroyed before they can destroy the Stasis Field. Stasis Field is often forbidden in multiplayer games, because it allows a "cheesy" tactic: freeze the enemy ship on the first combat turn; on subsequent turns deactivate the field, fire at the enemy, and then reactivate the field, leaving it frozen once again. As a result the enemy ship spends all its own combat turns frozen and unable to act. This makes it easy to defeat the Guardian once you have researched the field. Ship Special System that: increases by 3 the damage that shields can absorb before failing; allows shields to operate inside a Nebula; prevents Transporters from being used against the ship even with shields down; prevent shield-piercing weapons from bypassing the ship's shields. Quite a package, but most of the benefits depend on having good shields. Best choice for non-Creatives: difficult, because all are fairly useful. Hard Shields is the easiest to use and most versatile because Cloaking Device and Stasis Field require a suitable mix of ships and good tactics. Stasis Field requires good shields and armor, because any sensible opponent will try to destroy as soon as possible any ships with Stasis Fields; and the "cheesy" tactic above also requires good "beam" weapons and a good computer, as it only works with beam weapons. Ship Shield that: completely negates 7 points of damage from each weapon that attacks (these do not even weaken the shield) ; absorbs 35 times the ship's size class in damage before failing, i.e. 35 for a Frigate to 140 for a Battleship. Regenerates 30% of its maximum strength per combat turn. This shield is the first that that offers reasonable protection against Plasma Cannons even when these are boosted by High Energy Focus; considering how brutal Plasma Cannons + High Energy Focus can be, this level of protection may be a life-saver. Building that changes a Radiated planet to Barren for as long as the Flux Shield is present; the change allows terraforming. Also reduces by 10 points all damage caused by attacks. Not such a strong defense in relation to attacking ship's capabilities as Radiation Shield was when it first became available; but ground-based defense should now have better armor, so a Flux Shield may blunt attacks by enough for them to outlast attackers, especially as "beams" and missiles only do 50% damage to a planet. Appears so late in the game that the ability to terraform may not influence the economic balance of power significantly. Ship Special System that increases the equipped ship's Missile Evasion by +130% and increases the Missile Evasion of all friendly ships in combat by +70%. Cannot be used with any other jammer, and the bonus is not cumulative with that of jammers on the other ships (they simply get whichever is better). Best choice for non-Creatives: if you already have good shields and have been able to wait this long for a Jammer, Wide Area Jammer is a good choice; Otherwise choose Class VII Shield, as Flux Shield makes less difference than Radiation Shield would have done earlier (if you skipped Radiation Shield earlier and then regretted it, it's probably too late for you to do much about that). If you choose Wide Area Jammer at this point you can think about creating a support ship comparable to an Interdictor Cruiser in Star Wars. Since ship specials are the same percent of ship capacity from size 3 higher, a size 3 ship is optimal. Put a Wide Area Jammer, Warp Dissipater, and Scout Lab if you have them for its support functionality. Everything else is purely defensive - stack in as much missile and beam defense, shields, hull, and armor as you can shove into it. Any space you have left should be dedicated to fighters, because since they are away from the front lines they are unlikely to be shot down. These fighters, preferably Interceptors, are mostly there either to shoot down other fighters or missiles that are chasing the support ship. It helps not to have Dauntless Guidance System (so they don't chase the enemy fleet), and to group them in single units to mete out according to missile/fighter group size. Just remember that since ECM bonuses are not added, any jammers on other ships you have there will be useless, so don't put them in your ships. This ship is also an excellent place to put your captain with anything that benefits the entire fleet. If you care about him you can give him a bigger ship. Type: Ship Special System that causes all attacks to have a 30% chance of missing, regardless of all other factors (does not work on the Stellar Converter). Ship Special System that allows a ship to make a jump of up to 18 squares in combat without moving using any combat movement points, i.e. it still has its full normal movement afterwards; but that means you can't perform hit-and-run attacks by doing a normal move first and then teleporting out of range of retaliation - on the other hand if an enemy is stupid enough to remain stationary within range you can fire (no turning first) and then teleport away. Subspace Teleporter can be effective against torpedo ships if you get the timing right: go in and fire on the turn in which they do not fire, teleport away when they've fired. It can also be effective against missile ships, if you can tempt them into firing all their missiles so that you can decoy the missiles to the far side of the combat map and then teleport in to do some damage. Since these tactics mostly involve firing at close range, you don't need such a good computer to make "beam" weapons effective. Subspace Teleporter might also be a way to make Pulsar (above) an effective weapon against closely grouped ships, especially as Pulsar is inherently a 360° weapon so you can teleport immediately behind the enemy, where it's hard for them to hit you with most beam weapons (this tactic is even better if you get the exotic Spatial Compressor, which is a lot more powerful than Pulsar; if you beat Orion's Guardian you get a free Battleship that has this combination). Subspace Teleporter can also be used to make a superb bomber, provided it has escorts with very long-ranged weapons (possibly OV Proton Torpedoes or NR Plasma Torpedoes) - the defending ships will have nasty dilemma: if the defenders move forward to attack your long-range ships, the bomber teleports in to attack the planet; if they cluster round the planet to defend it from the bomber, they get pounded by the long-range ships. The down-side of these tactics is that the enemy get to fire their beam weapons at short range, so very good shields and armor are essential, and this might even be a rare good use for an Automatic Repair Unit. But there's a tactic that avoids this risk - if you can make a ship that has Subspace Teleporter and Stellar Converter, teleport as far away as possible from danger and then use the Stellar Converter's unlimited range and deadly accuracy. Ship Special System that increases beam defense by +100% and negates turning costs, i.e. you turn and still have your full combat movement available. Inertial Nullifier is ridiculously bulky until it's been miniaturized a few times. Best choice for non-Creatives: Subspace Teleporter - have fun, invent new sneaky tactics and ship designs! Ship Shield that: completely negates 10 points of damage from each weapon that attacks (these do not even weaken the shield) ; absorbs 50 times the ship's size class in damage before failing, i.e. 50 for a Frigate to 200 for a Battleship. Regenerates 30% of its maximum strength per combat turn. Simply the best shield. Building that changes a Radiated planet to Barren for as long as the Barrier Shield is present; the change allows terraforming. Also reduces by 20 points all damage caused by attacks (x2 vs. beams and missiles), and completely blocks ground troop invasions and biological weapons - good if the enemy has no powerful bombs. Almost as strong a defense in relation to attacking ships' capabilities as Radiation Shield was when it first became available. Also ground-based defenses should now have better armor, so a Barrier Shield may blunt attacks by enough for them to out-last attackers, especially as "beams" only do 50% damage to a planet. Can render many shipboard attack systems useless if your opponent is still using lower tech weapons. Appears so late in the game that the ability to terraform will not influence the economic balance of power significantly. Ship Special System Ship Special System that makes ships completely invisible on the Galaxy map except to Omniscient empires, and completely invisible in combat as long as it stays cloaked and does not fire (but it can stay cloaked while moving in combat). Can only provide full invisibility for 10 combat turns, then functions as a Cloaking Device. When decloaked, the ship must wait one turn without firing to recloak. Note that Colony Ships and Troop Transports cannot have any kind of cloaking, so this tech is only good for raids, usually aiming to bomb colonies. At this stage in the game ships are fairly fast in combat, bombs are more powerful and Transporters may now or soon be available, so bombing raids are a real threat, especially as the Cloaking Device also gives the ship some protection while moving into bombing range. Increased ship speed also makes it possible to use the Phasing Cloak to pull off surprise attacks to eliminate Star Bases or small groups of enemy ships. Almost guarantees that you get to shoot first, even where the enemy would usually shoot first (if your computers are inferior or if you are fighting Space Monsters or Antarans). Phasing Cloak is ridiculously bulky until it's been miniaturized a few times. Best choice for non-Creatives: probably Class X Shield, as Planetary Barrier Shield will usually make little difference at this late stage and Phasing Cloak is usually too bulky to be of much use until miniaturized a few times by expensive Hyper-Advanced research. Some very high-tech Force Fields components are very bulky when first discovered, and will benefit a lot from a few levels of Hyper-Advanced Miniaturization. This page was last edited on 27 September 2018, at 00:50. This page has been accessed 42,943 times.